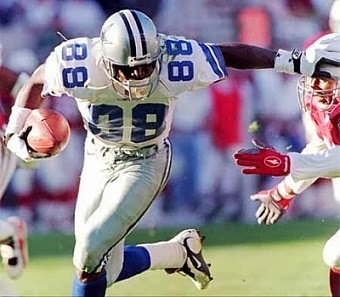 Following the 1992 and ’93 NFL seasons, the Dallas Cowboys and San Francisco 49ers had met for the NFC Championship, with Dallas winning both times on the way to victories in the Super Bowl. On January 15, 1995 the two clubs faced off for a third time with the conference title on the line. The 49ers, coached by George Seifert, had put together a league-best 13-3 record to top the NFC West for the eighth time in nine years. QB Steve Young (pictured at right), mobile and highly accurate with his lefthanded passing, led the league with a 112.8 passer rating plus 35 touchdowns, 8.6 yards per attempt, and a 70.3 completion percentage. Star WR Jerry Rice topped the NFL in receiving yards (1499) on his 112 catches. RB Ricky Watters was productive both running the ball and catching it out of the backfield. The defense benefited from the presence of CB Deion Sanders and had other Pro Bowl talent in DT Dana Stubblefield, FS Merton Hanks, and SS Tim McDonald. Dallas had a new head coach for 1994 in Barry Switzer, who replaced the departed Jimmy Johnson, architect of the club’s previous success. The core of the offense was back in the persons of QB Troy Aikman, RB Emmitt Smith, and WR Michael Irvin. DE Charles Haley anchored the defensive line while SS Darren Woodson was also an All-Pro in the backfield. The Cowboys were nicked up on the offensive line, however, and while Smith had rushed for 1484 yards and 21 touchdowns, he had been hampered by hamstring problems. Both clubs had handily won their NFC Divisional playoff games, with the 49ers defeating Chicago by a score of 44-15 and Dallas whipping the Packers 35-9. There were 69,125 fans in attendance at Candlestick Park. The field was in poor condition after a week of heavy rain in the Bay Area leading up to game day. On the third play from scrimmage, San Francisco CB Eric Davis (pictured below) intercepted a Troy Aikman pass and returned it 44 yards for a touchdown. 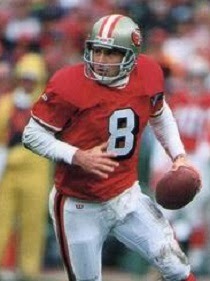 Doug Brien added the extra point and the 49ers were in front by 7-0 with barely over a minute of time elapsed. The next Dallas possession again resulted in a turnover, and it was once again Davis making the play as he forced Michael Irvin to fumble after gaining 16 yards on a pass from Aikman. Tim McDonald recovered at the Dallas 39 and, five plays later, Young threw a short pass to Ricky Watters, who went the distance for a 29-yard TD. Brien’s kick put the Niners up by 14-0. Things continued to go wrong for the Cowboys as, on the ensuing kickoff, WR Kevin Williams was stripped of the ball by RB Adam Walker after a 22-yard return and Brien recovered for the 49ers at the Dallas 35. Runs by Watters and FB William Floyd picked up nine yards and Steve Young gave the home team a first down with a two-yard sneak up the middle. Two plays later, Young threw to WR John Taylor for 14 yards and followed that up with a quarterback draw that gained nine yards to the one yard line. From there, on the seventh play of the series, Floyd bulled over for a touchdown. Brien again added the PAT and, with the opening period not quite halfway over, the 49ers held a 21-0 lead. Now in a deep hole, the Cowboys put together an eight-play, 62-yard scoring drive. FB Daryl “Moose” Johnston converted a third-and-one with a carry for four yards, Williams gained eight yards on an end-around, and a sack of Aikman was negated by a defensive holding penalty. Finally, facing third-and-23 at the San Francisco 44, Aikman threw deep for Irvin and connected for a touchdown. Chris Boniol added the PAT and the score was 21-7 after a period of play. The Cowboys had the ball again heading into the second quarter and reached the San Francisco 10, but Boniol was wide on a 27-yard field goal attempt. The 49ers drove 64 yards in 11 plays in response, helped along by a 33-yard pass interference penalty on CB Larry Brown. Watters had an 11-yard run, Young carried for six, and Young converted a fourth-and-three play with a completion to TE Brent Jones for ten yards to the Dallas 17. After the usually-reliable Jerry Rice dropped a pass in the end zone, Brien finished off the series with a 34-yard field goal to extend the home team’s lead. With just under six minutes remaining in the half, the Cowboys came back with a 63-yard drive in eight plays. Aikman had two completions to TE Jay Novacek, covering 15 and 19 yards, and Emmitt Smith ran for a four-yard touchdown. Boniol’s extra point narrowed the San Francisco lead to ten points. The teams traded punts until the 49ers, taking advantage of a 23-yard kick by John Jett, took over at the Dallas 39 with thirty seconds left on the clock. Two carries by Floyd picked up 11 yards before Young fired for Rice in the end zone for a 28-yard touchdown. It was a huge boost for the 49ers, and they took a 31-14 lead into halftime. The Cowboys got a break on the second half kickoff when Adam Walker muffed the kick and CB Dave Thomas recovered for Dallas at the San Francisco 25. Seven plays later, and helped along by a penalty on LB Rickey Jackson for a blow to Aikman’s head on a third down play, Smith ran one yard for a TD and, with Boniol’s conversion, it was a ten-point game once again. However, the 49ers came right back with a drive of 70 yards in ten plays. Young completed three passes, including one of 17 yards to Taylor to reach the Dallas 38 and another to Jones of 12 yards in a third-and-five situation. Young ran for the final three yards, just reaching the end zone for a touchdown that, adding the extra point, made the score 38-21. The Cowboys came back throwing, with Aikman hitting Williams for 18 yards and Irvin for 20 before being picked off by Deion Sanders. The 49ers put together a methodical possession that carried into the fourth quarter and ended with a Klaus Wilmsmeyer punt that had the visitors starting at their own 11. Still, Dallas battled back and drove 89 yards in 14 plays. Smith ran effectively and Aikman completed six passes, the last to Irvin for a 10-yard touchdown. But that was it for the defending champs. Dallas got the ball twice more and turned the ball over on downs both times. At one point Coach Switzer, furious that Sanders was not called for pass interference, bumped an official, which resulted in a 15-yard penalty against the Cowboys which was followed by Aikman being sacked by DE Tim Harris on fourth down. The 49ers won by a final score of 38-28. Dallas had more total yards (451 to 294) and first downs (29 to 19) as they played catch-up throughout the contest. However, they also turned the ball over five times, three in the first quarter to put themselves in a hole, to one turnover by the 49ers. San Francisco also recorded four sacks and Aikman was knocked down on 14 other plays. Steve Young completed 13 of 29 passes for 155 yards and two touchdowns, with none intercepted, and also ran the ball 10 times for 47 yards and a TD. Ricky Watters rushed for 72 yards on 14 carries and scored a 29-yard touchdown on his lone pass reception. William Floyd contributed 20 yards on 7 rushing attempts that included a score and had three catches for 16 yards. Brent Jones also had three receptions, for a team-leading 37 yards, while Jerry Rice was right behind with 36 yards on his two catches that included a TD. Defensively, DT Rhett Hall and Tim Harris had two sacks apiece and Eric Davis intercepted two passes, one of which was returned for a touchdown. For the Cowboys, Troy Aikman went to the air 53 times and had 30 completions for 380 yards and two TDs, but gave up three interceptions. Michael Irvin (pictured below), with 12 catches, tied the record for pass receptions in a NFL/NFC Championship game set by Raymond Berry of the Colts in 1958 and set a new standard with 192 receiving yards while scoring twice. Kevin Williams added 6 pass receptions for 78 yards and Jay Novacek contributed 72 yards on his five catches. Emmitt Smith ran for 74 yards and two TDs on 20 carried before leaving the game with nine minutes remaining due to a pulled hamstring. The 49ers went on to win the Super Bowl with ease over the San Diego Chargers. 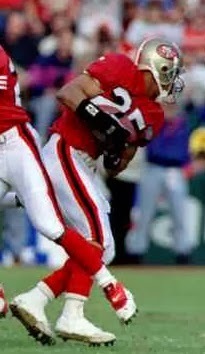 They again topped the NFC West in 1995 but lost in the Divisional playoff round. Dallas came back strong to post a 12-4 record in winning the NFC East and, this time defeating the Packers for the conference title, returned to the Super Bowl where they defeated the Steelers. While coming up short on achieving three consecutive NFL Championships, the Cowboys still managed to win three in a four-year span.